Every year the long weekend rears its glorious head numerous times and l sigh in absolute relief. That is until I suddenly panic and realise I don't want to waste it. There are only a handful of long weekends in the year, and so it's essential to make the most of them, even splash a little cash for once and take a well earned break. That's what I tell myself anyway. Planning in advance can pay dividends, but sometimes last minute deals offer the best value. Those who work hard not only deserve a break but need it. A long weekend away can breathe new life into a relationship, cement a friendship or create unforgettable family memories. For those who are feeling in a rut, it can provide the perfect recharge opportunity. 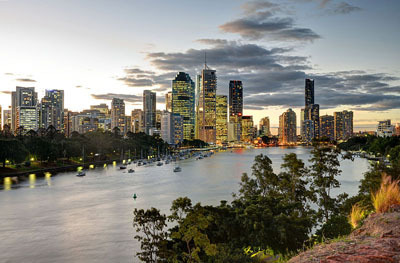 So here is a list of six of the best ever long weekend trips from Brisbane. All except the first one are within a two hour drive of Brisbane CBD for maximum convenience. 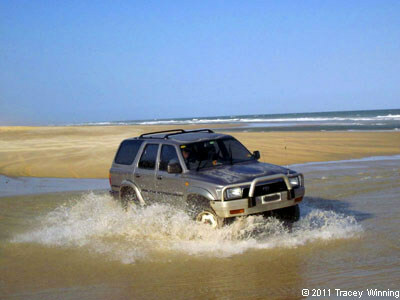 Fraser Island is a real adventurous getaway that is perfect for those who love the outdoors, swimming, sand, and fun. Take your own four wheel drive across on the ferry or hire one, and blaze along the sandy beaches like there is no tomorrow. For those that stay at Fraser without a four wheel drive, you can always book day tours from the resorts. My last trip to Fraser Island involved swimming the amazing crystal clear blue water at Lake McKenzie while watching a dingo venture into the water to cool itself off. It also involved walking along Eli Creek on the boardwalk and then floating back down the creek's astonishingly clear emerald waters to cool off. There are shipwrecks, a lighthouse, other perfect swimming creeks, rainforest, and fun scenic four wheel drives on the sands of seventy five mile beach. There are plenty of beach houses for holiday hire at very reasonable prices, or you can stay at a resort such as Eurong Beach Resort or Kingfisher Bay Resort. Hiring a house with lots of rooms and bringing your friends and own food can turn this long weekend into a low cost one. Where: About 2 hours 45mins drive from Brisbane to Rainbow Beach, then about a 20 minute drive to the barge at Inskip Point. The barge ride (for you and your vehicle) takes about 10 minutes to arrive on Fraser Island. The Green Mountains is a true getaway studded with lush spectacular rainforest offering short or long hikes, fantastic views, loads of wildlife and nature at its finest. Whether you take a treetops walk, hike deep into the rainforest to the Blue Pool, Stairway Falls or Picnic Rock, there is no shortage of action and adventure. For the less adventurous, there is a hot tub, plunge pool, owl and eagle show, nature movies, rainforest bar, and beautiful birds everywhere, leisurely guided bird walks and birds of prey flight show. 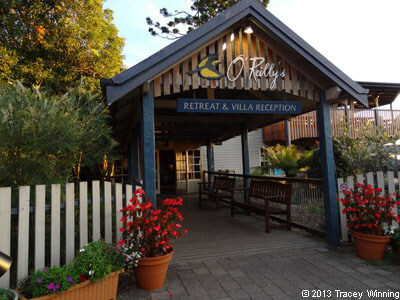 O'Reillys Rainforest Retreat sits overlooking the valley and is perfect for a two to four night stay. There are individual mountain villas with hot tubs on the balcony and an infinity pool or different levels of accommodation in the retreat itself. Be sure to ask for a modern room: one bedroom canopy suite or modern mountain view room with a balcony. If price is an issue, there are camping grounds right near the retreat and barbeques. Scenic pretty Montville offers a quaint little mountain town with wonderful unique and cute shops which easily take a day of leisurely wandering to enjoy. There is a plethora of irresistible cafes to relax away the hours and a host of heavenly mountain views to lose yourself in. There are many accommodation options to choose from including B &B's and self contained cottages. For a romantic luxury escape, there is a cottage at Narrows Escape Rainforest Retreat with a spa, fireplace and a beautiful salt water rock pool in the mountains. For those who want pure relaxation, pampering and a unique experience, stay at the Sofitel Hotel in Brisbane and book the Opal Rasul Temple in Stephanie's Spa. The stunning temple takes up to three people at one time and includes tropical rain, mud therapy, and warm steam. The Sofitel has its own outdoor heated pool lined with deck chairs and is perfect for relaxing. Of course Brisbane also offers the lovely Botanical Gardens for a picnic lunch and stroll, Southbank for shopping, restaurants, markets, art galleries, and its own inner city beach. 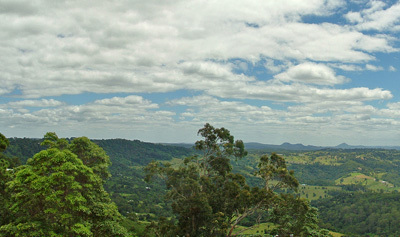 Mount Tamborine really does have something for everyone. With gushing waterfalls, rock pools, rainforest walks, romantic Bed and Breakfasts, and a quaint village filled with delightful intriguing stores and fabulous places to dine. 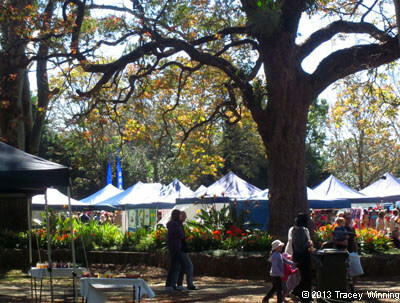 There is nothing like a mountain market and Mt Tamborine Market provides a delightful morning out. There is no shortage of things to do on a long weekend in Mt Tamborine and that makes it a perfect place to visit over and over again. A particularly great walk in this area is Sandy Creek Circuit with Cameron Falls, and one of my favourite places to visit includes St Bernard's Historic Hotel with its fabulous grounds and views. For a very special B & B, I suggest Avocado Sunset Bed and Breakfast in North Tamborine or The Polish Place, also at North Tamborine. 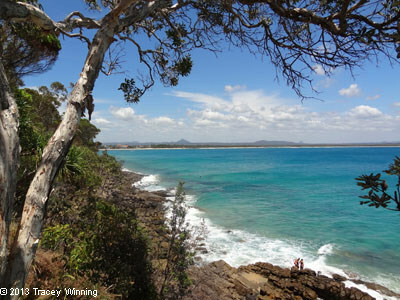 Noosa Heads has one of the most gorgeous swimming beaches in Queensland. Noosa's Main Beach is somewhat sheltered, safe for swimming with turquoise waters and views to the headland of Noosa National Park. The big sandy beach beckons and the National Park walks along the water are stunning. Just remember to take a towel, swimmers and water when walking along the headland as there are a few tempting swimming spots you can scramble down to along the way. Hastings Street in Noosa is crammed with great places to eat, a nice ambience and lots of nice shops. Staying within walking distance saves the hassle of finding parking along this extremely popular street. Perfectly located for a Hastings Street stroll, and parked almost smack on the sand is On the Beach Noosa with spa tubs on the balcony overlooking the beautiful beach. If those prices don't suit, there are countless other options to suit all budgets from hotels, motels, and resorts to self contained apartments. If you are in a rut, it is important not to sit at home on the couch and fritter away another long weekend, but to put yourself first and book a luxury apartment, or a motel in a sensational prime location, or a campsite with views forever. Budgeting is important, but a little indulgence on a long weekend away may keep your batteries recharged for many many months ahead. Cost: From the cheap to the expensive - you decide.